It’s just after nine when I finish breakfast at the Hotel Patritius and venture cautiously outside. Much to my surprise and relief, it’s a beautiful morning in Bruges. The sky is blue under a canopy of white clouds, and the effect of sunshine on my mood after five consecutive days of rain is so pronounced that I can feel an actual spring in my step. Soon, the tour buses will arrive and the crowds they bring will devour the city like a hoard of locusts, but for now there is magic in the quiet medieval streets. I turn right at the end of Riddersstraat and walk past the Burg to the Markt, before heading left down Wollestraat, popping in and out of small shops along the way. 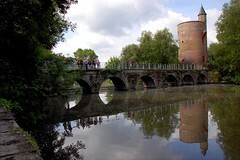 When I reach Dijver, I stroll along the canal, where horses and buggies are already at work, and then zig zag past the Church of Our Lady and St. John’s Hospital to Mariastraat, where a display of colorful pashminas catches my eye fluttering in the breeze. With the help of a eager clerk at Memlinck, I try on several before choosing one that is woven in deep autumnal colors. She frowns, disappointed, and says it makes me look sad, but all-in-all I think it suits me well. Next, at Atelier Galerie Kasper, I buy a small ceramic plaque depicting a timeless view of Bruges—the shaded Minnewater, complete with swans, and the entrance to the Begjinhof. By the time I wind my down through the park and out into the ring of traffic that surrounds the city to the train station, it’s past 11. 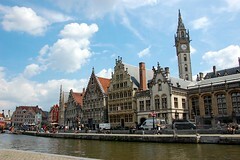 I still plan on taking a day trip to Ghent, but I’m in no particular hurry to get there. The journey to Gent-Sint-Pieters station is an easy half an hour. 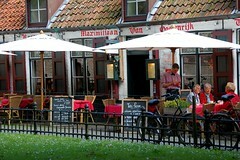 At the ticket window, I buy a day pass for the trams and then head to the Korenmarkt stop in the historic center of town. It’s midday by the time I reach the banks of the river Lieve, which is lined on either side by the Graslei and the Korenlei, two of Ghent’s most picturesque streets, and people are basking there in the sun and chatting happily at sidewalk cafés. In the distance, I can see the flags and stone turrets of the Gravensteen rising above the gabled buildings that surround it and since I’m not yet hungry for lunch I decide to make that my first stop. 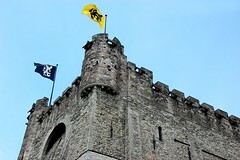 Gravensteen is a Dutch word that means “The Castle of the Counts.” The current fortress and its moat date from the 12th century, although some of the remains are earlier still. It’s a massive complex and one that is not uninteresting—but let’s be honest—it’s no Tower of London. For me, what’s most memorable is not the structure itself, but the truly odd multimedia guide that’s thrust into my hands as I enter. It seems to consist entirely of poorly scripted videos that act out various fictional scenes in the history of the castle. It’s part cheesy soap opera, part low-rent episode of “The Tudors.” Or, are those one and the same? I’m still laughing about it later at lunch, over a bowl of tandorri chicken salad with linguini at Exki. 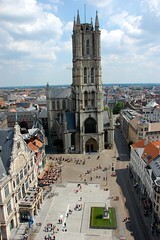 Afterwards, I climb to the top of the Belfort en Lakenhalle for a commanding view of the city, and then head into the dim light of St. Bavo’s Cathedral. Given how massive it looked from the top of the belfry, the interior seems oddly small and plain at first, until I realize that much of it has been cordoned off for restoration work. Fortunately, the altarpiece that inspired my entire visit to Ghent is still on view in a crowded chapel at the rear of the church. I’ve come to see the beautiful and mysterious “Adoration of the Mystic Lamb,” a polyptych completed in 1432 by Hubert and Jan van Eyck. Stolen at one point by French revolutionaries, it was recovered and then pawned and its panels cut lengthwise. Following World War I, it was returned to Belgium as part of the war reparations in the Treaty of Versailles, but in 1934, one of the twenty-four scenes, known as the “Just Judges” was snatched by art thieves, held for ransom, and never recovered. In a tale worthy of Dan Brown, some believe it was because it contained a coded message relating to the Holy Grail. Then, less than a decade later, the rest of the work was looted by the Nazis and hidden deep in a salt mine near Salzburg, Austria, where it remained until it was recovered by U.S. troops and returned to St. Bavo’s Cathedral once more. I stare at the work, transfixed, as its sordid history runs through my brain, and find myself amazed at its survival and at how luminous its colors remain. It has been worth the trip to Ghent and more. It’s after 4:00 PM by the time I catch the tram back to the station. I check the departures board and in a rush jump onboard the wrong train. I squint out the window and start to panic when I realize that I’m heading to Antwerp, not back to Bruges. A kindly conductor smiles calmly and tells me to get off at the next stop, Gent-Dampoort, and retrace my steps. “Don’t worry,” he says, “you’ll get there in the end.” I like that sentiment. And he’s right, too. Gradually, I fall into causal conversation with the couple sitting next to me, and they offer to buy me a cup of tea. They both live and work in Bruges, and the woman owns a jewelry shop nearby, one I had admired while shopping earlier in the day. We talk about politics, fashion, and travel, about the Belgians’ lingering resentment towards the Germans for their atrocities during the war, and their hopes for President Obama and the Americans. We talk for a long while, while their golden retriever naps quietly at our feet, her back leg stitched and bandaged following a recent accident. When at last we stand to leave, and they gently pick up the dog and pull her home in a small red wagon, I know that I will leave Bruges with the sweetest of memories, not all of which are about the chocolate.